Act I of a magnificent Vuelta a España ended on Sunday when Philippe Gilbert reached the finish line in Barcelona. The fight between Gilbert and Purito Rodríguez was the perfect finale for a week of dynamic scenes that, in the end, allowed the classics specialists to take center stage. Now the stage is reset. From the metropolis of Barcelona, La Vuelta has crossed Spain to arrive in Galicia, at Finisterre, the end of the earth. The setting for Act II is the rocky coasts, mysterious holy places, and haunted mountains of Celtic Spain. This is where the plot will develop, and where the ultimate hero will reveal himself. A key element in any epic tale is the quest. La Vuelta is an epic, and Galicia is a land of quests, along the Camino de Santiago, in Celtic legends, and this week, along the race route of a grand tour. Each of the Vuelta stars has a quest to seek in the upcoming days. Can Purito continue as leading man and defeat his enemy, the time trial? 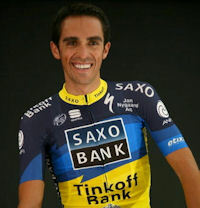 Will Contador conquer the monstrous peaks of Asturias as he did in 2008? Can the Spaniards slay the dragon Froome? What surprises await? We cannot know until the story unfolds. Now the curtain is rising. It’s time for Act II of the 2012 Vuelta a España to begin. Que espectáculo en La Vuelta. Contador gana la etapa y se coloca líder por delante de Valverde y el ‘Purito’.